Night-vision IP camera systems provide surveillance in total darkness. These network attached PTZ camera systems include built-in IR illumination. There are a number of off-the-shelf models available, and custom designed very long range camera systems that are designed to your requirements. Some of the off-the-shelf PTZ cameras are configurable. They provide a choice of 940nm, 850nm IR or white light illumination. 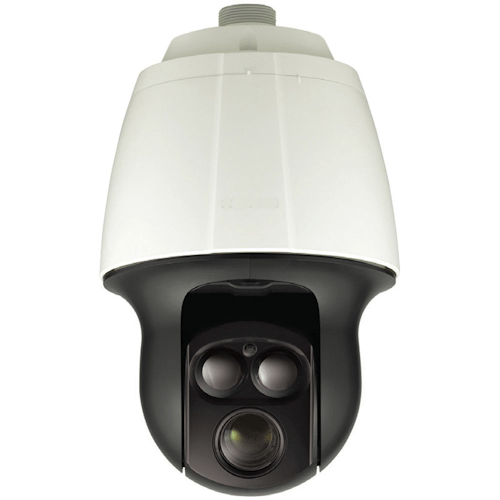 All these PTZ cameras include smooth and accurate 360° of rotation with remarkable speeds. Do you need to see very far away? If you need a system that can see up to 5 miles away, take a look at the very long range optical PTZ systems with IR illumination, or the thermal imaging PTZ systems that operate without any lighting. These standard night vision PTZ network attached cameras feature up to 37 X optical zoom lens with 850nm IR illuminator. They are excellent for covert nighttime security applications. The Distance Comparison Chart compares how far you can see. It provides the detection, recognition and identification distances of each PTZ camera. When you need to see in the dark: For surveillance applications where light is not sufficient, i.e. Night-time scenarios, an infrared illuminator is a great way to enhance your view of sight. Composed of multiple light emitting diodes (LED’s), the infrared illuminators produce an infrared beam of light which when paired with a day/night camera will illuminate the surrounding area for increased visibility in total darkness. Detection: an object is present. A vehicle can be detected further away than a person, so it depends on the size of the object you are trying to detect. Recognition: This is defined as the point at which you can classify the type of object. You can tell that an object is a person, animal, or vehicle. You can also determine if it is a truck or a tank. Identification: There is enough resolution to determine that it is a man or women (by the way the person is dressed), or that the person is carrying a gun. Note that the Johnson criterion for identification doesn’t include identifying a person’s face. You require much more resolution to provide facial recognition. Note this 4K very high-resolution camera provides a much wider field of view (or viewing area) than the lower resolution cameras. A special camera that can look up as well as down. Configurable PTZ camera. Night Detection with IR or white light: Two IR illumination angles 10° and 30° 200m (656 ft.) using white light. A rugged camera that can operate in high wind loads of up to 135 mph (216 Km/h). Tilt up and down (90° to -90°). Rugged PTZ camera. Long-range IR illuminator and very low light sensitivity. Tilt up and down (90° to -90°). Rugged PTZ camera. During the day the TVIP-ULS-IP-HD PTZ provides enough resolution to identify a license plate over 700 ft. (213m) away. The PTZ system includes a 2-megapixel camera and up to 129mm zoom lens. At night the distance depends on the type of illumination used. The model TVIP-ULS-IP-HD-XLux provides very low-light sensitivity of 0.006 lux in color. Select 850nm, 940nm (covert), or white illumination. Maximum night view range is 200 m (with white light). This special long range camera can look up as well as down and is available with optional illumination, power, and wiper. It is designed for rugged applications, and can even be mounted on vehicles. The WV-SUD638 is an environmentally rugged camera designed to meet extreme weather conditions. Using the latest aerodynamic technology and salt-air corrosion resistant glass fiber body, this IP PTZ camera can withstand the beating from tropical storms, arctic blizzards, extreme hot and cold temperatures, and gale-force winds. This PTZ camera includes a very long-range IR illuminator. The IR has a range of 1000 m. The 2-Megapixel camera has very good low light sensitivity. The 0.05 lux color low light sensitivity provides very good low-light operation. When it switches to gray-scale (or BW mode), it can see things at an amazing 0.01 lux. It can operate in full moonlight. During the daytime, the cameras 6.6 mm to 330 mm (50X) zoom lens can detect a person that’s 7000 m (over 4 miles away). If the field of view is partially illuminated by the moon or standard lights, it can recognize a person at over 1900 m (over 1.1 miles) away. At night the built-in IR illuminator has a range of 1000 m. This camera has the longest nighttime range of all the off-the-shelf PTZ cameras. SNMP, DNS, DDNS, NTP, RTSP, RTP, TCP, UDP, IGMP, ICMP, DHCP, PPPoE. This camera system includes an optical camera and thermal camera in one unit. A thermal camera provides different viewing characteristics than an optical camera. It does not require any light, but rather detects the thermal radiation from the target. The more the target temperature differs from the surrounding area, the brighter the object will appear. For example, it is excellent for detecting a warm human in a cold snowfield. You may miss the person in an all-white outfit on a snowfield, but you will not miss them with the thermal camera. The “hotter” the object the further away it can be detected. The thermal camera has a resolution of 640 x 512, and with the 75 mm thermal lens can detect a person about 1800 ft (560 m) away. The 330mm zoom lens on the optical camera provides daytime detection at about 7 miles (10Km) away. When there is enough light, the camera can “recognize” if it is a person or dog at a distance of about 1.5 miles (2.4Km). We can “identify” if the person we see is a man or women (based on how they are dressed), at a distance of almost one mile (1.5Km). All this is during the day. At night, this thermal-optical camera can detect a person about 1/3 of a mile away (560 m). The thermal detection distance can be greater (over 1000 m) depending on the temperature difference of the object you are viewing. The IR-illuminator has a range of 500 m.
A very nice feature of this camera is that the IP video for both the thermal and optical camera is on a single network connection, with two separate streams. Network Single network connection with two video streams. One for the optical camera and the other for the thermal camera. Single network connection with two video streams. One for the optical camera and the other for the thermal camera. Need help selecting the right camera? We can help. Just contact us at 800-431-1658 in the USA, or at 914-944-3425 everywhere else, or use our contact form.